Is that a microwave above the knifedraw? Who makes it? i just installed a KitchenAid warming drawer that also has a slow cooker function. So, I'm hoping to use this in place of the counter top slow cooker that I often use. That would bring the use of the warming drawer up to a few times a month !!! Refrigerator - What company is the fridge? i like the curtain, where is it from? I like the knife block insert. Is it custom? Does the knife drawer have a lock mechanism to keep little ones out since it is so low? I'm late in commenting here...but if you're still in need of an in-drawer knife block, we custom make them (as well as drawer inserts) and ship them to you. These are inserts that are sized for and placed into your existing drawer. Our online design wizard walks you through the design and ordering process. What is the wood & cabinet brand. - What is the wood & cabinet brand? what stone is the countertop? what about the floor??? is that tile or porcelain? and whats the name? Tall Liehberr Refrigerator - Thinking about purchasing a tall Liehberr refrigerator. Can anyone provide a short review? I'm not familiar with Liehberr. I'm renovating my kitchen and wanted a built in refrigerator. Liebherr was the only one that would fit. It had excellent reviews when I looked into it. I love my new refrigerator! I have a tall liebherr frig, biodraws with two drawer freezer on bottom. It's about 2 years old now. I'm 5'2 so it took some getting used to the tall space. But I really like this frig. It's bright, and I actually found that I can see stuff on the top shelf because of the glass shelving and the height angle. In the other frigs, stuff just got lost in the back which ended up spoiling. I do need a step stool to access the top shelf, and also the controls on the top. We also live on and island, so keeping produce and veggies fresh was a big challenge with our other frigs. 1. love! love! the fact that I can keep my fruits and veggies way beyond their normal shelf life in the biodraws. Strawberries and lettuce, baby greens will last at least 2 weeks. My prior frigs, I would have moldy, wilty stuff within a few days. 2. the no frost is a lifesaver. No more frosted stuff in my freezers. In fact I had completely forgotten about that, and when we had a service call, I asked the tech how to defrost the frig. 4. Cleaning the vent is incredibly simple too. Easy to remove and a quick wash.
1. Poor, poor door design. In my frig you are suppose to lay your soda/water/wine bottles ontop of the bio draws (there are shallow indents to keep them from rolling). But when you do, you can't shut the door, because more-often-then-naught the bottles are too long. My guess is because the frig is european in design. When in Europe I've noticed that most beverage containers are smaller/shorter. Unfortunately here in the states, they are just to big to fit. So I really can't fit wine or soda bottles in the frig at all. We have a basement frig for additional supplies and that's where they go. 2. Poor, poor door design. The shelves in the doors are roomy, but when the door completely shuts they jut into the shelving space in the main part of the frig. about an inch. So the door will pop open, because the stuff on your main shelves (which are not hanging out) will interfere with the stuff on your door. I find I cannot fully utilize the door space because of this. 3. Poor, poor door design. The shelving brackets on the door also are not very tall, so taller jars tend to fall over whenever you close or open the door. So if it weren't for the doors I'd really, really have nothing to complain about! If you do get a Leihberr, I recommend having a professional Leihberr install. We had our contractor, and he was somewhat confused with the European directions, and didn't quite adjust the door properly. It kept popping open slightly after it was heavily shut (as kids tend to do) and when we had a repair this summer the tech pointed that out to us. Now the door shuts perfectly even when slammed. paint color? - What is the paint color on the walls? Thank you for your question, but we were not involved with the paint colors used on the walls. can you convert my traditional cabinets to the displayed spice racks? It looks to be the same dimensions. Is the cabinet hardware nickel or chrome and brushed or polished? I'd go with the brushed look as it ties in with the stainless appliances. You don't want to cause attention to the hardware. They are plain & not the focal point of the room. No more knife drawers at child-level. Please! Cuisine neuve - Est-ce possible de savoir si c'est collé/emboité ou autre? Est-ce ajouté au tiroir ou fait à même le tiroir? Would you be so kind to let me know the mircowave drawer brand please? It's a warming drawer over the knife drawer. I think the warming drawer is from Bosch. Refidgerator - Where can you purchase this? Knife Drawer - Who built this drawer! 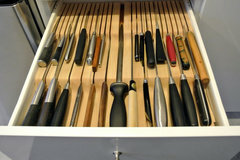 I built the drawer to fit the client's complete selection of knives. Thanks for noticing. Liebherr 24" Refrigerator Freezer - How much does it cost? We do not sell the appliances, so unfortunately I cannot give you a cost for the Refrigerator. Thermador Appliance - Is that a small oven? Or a microwave? A warming drawer? The Appliance shown is a 27"w Thermador Warming Drawer. Thanks! This knife drawer was custom built for the homeowner by the contractor. Fridge - Would you be able to track down the make a d specs on the fridge/freezer combo? The Refrigerator/Freezer is a Liebherr, 24" wide. Specs can be found on their website. 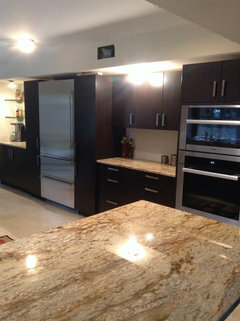 Pullout Dispensa Pantry - KB Cabinets- Thanks so much for opening the cabinets for this photo! Could you tag the Dispensa Pantry? It is manufactured by Kessebohmer Clever Storage. We appreciate your commitment to a functional & organized kitchen. Hi! Pull-out pantry! - What are the dimentions of cab with pull-out pantry and fridge..cab depth fridge? Thank you for your time. What is the tile flooring? Where can i get these sotroage accessories and what type floor is used in this kitchen? What kind of oven is - I need sources for durable different kitchen accessories like these in the picture with a catalogue if possible. What kind of oven is in the picture? what is the size of the under cabinet valance? - i am lowering my cabinets (I'm not very tall) and will be reducing my light valance to 1" - istha the sizse of yours? 2. Microwave drawer. 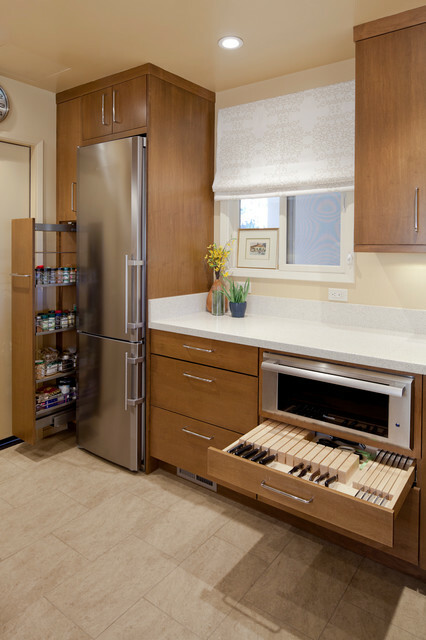 The knife and pantry storage in this photo may have caught your eye, but the true gem is the microwave drawer, which slides out and is accessed from the top. I use one in almost all my small projects these days because it keeps the microwave off the counter or wall and is ergonomic for everyone in the family to use. Knife drawer I've seen this style as the cutlery drawer also - I thought it might just be tedious to use but what do you think?